1. Excludes census data for one or more incompletely enumerated Indian reserves or Indian settlements. 2. ‘Aboriginal identity’ includes persons who are First Nations (North American Indian), Métis or Inuk (Inuit) and/or those who are Registered or Treaty Indians (that is, registered under the Indian Act of Canada) and/or those who have membership in a First Nation or Indian band. Aboriginal peoples of Canada are defined in the Constitution Act, 1982, section 35 (2) as including the Indian, Inuit and Métis peoples of Canada. 3. Users should be aware that the estimates associated with this variable are more affected than most by the incomplete enumeration of certain Indian reserves and Indian settlements in the Census of Population. For more information on Aboriginal variables, including information on their classifications, the questions from which they are derived, data quality and their comparability with other sources of data, please refer to the Aboriginal Peoples Reference Guide, Census of Population, 2016 and the Aboriginal Peoples Technical Report, Census of Population, 2016. 4. The category ‘Total – Knowledge of languages: single and multiple language responses’ indicates the number of respondents who reported each language, either as their only response, or in combination with another language. Total responses represent the sum of single language responses and multiple language responses received in the census. Source: CICH graphic created using data adapted from Statistics Canada – 2016 Census. Catalogue Number 98-400-X2016160. http://www12.statcan.gc.ca/census-recensement/2016/dp-pd/dt-td/Rp-eng.cfm?TABID=2&LANG=E&A=R&APATH=3&DETAIL=0&DIM=0&FL=A&FREE=0&GC=01&GL=-1&GID=1341679&GK=1&GRP=1&O=D&PID=110449&PRID=10&PTYPE=109445&S=0&SHOWALL=0&SUB=0&Temporal=2017&THEME=122&VID=0&VNAMEE=&VNAMEF=&D1=5&D2=0&D3=0&D4=0&D5=0&D6=0 -accessed October 19, 2017. 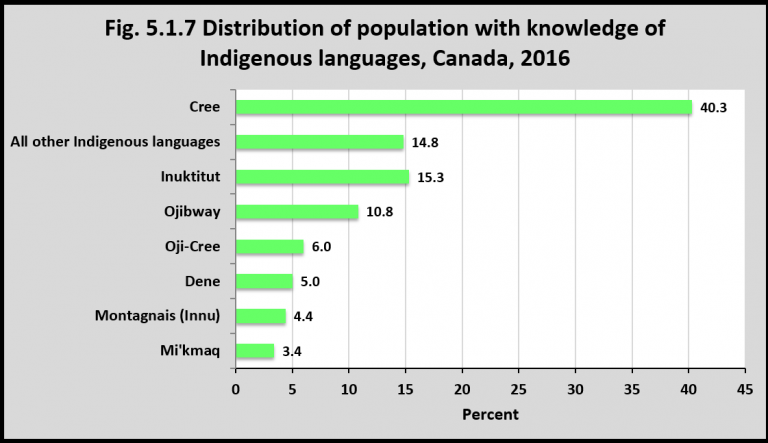 In 2016, of the 260,550 Indigenous people who reported knowledge of an Indigenous language, 40.3% reported that it was Cree (105,020 people). The next most common language was Inuktitut- 15.3% (39,770). Of the 50-70 Indigenous languages spoken in Canada, only three languages are still flourishing (Cree, Inuktitut, and Ojibway).1 Language preservation is seen as being important to the development of individual and collective identity, and the development of healthy and resilient individuals and communities.